How do you get the perfect shirt collar look? Let’s go through an overview of the problem first. 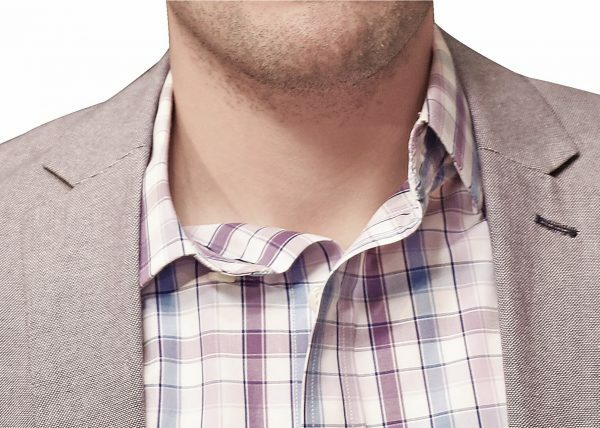 The shirt collar folding problem gets worse when a jacket is worn over the shirt. Shirt collars often completely collapse under the weight of the jacket, sometimes with one side folded and the other standing up. Golf shirts and softer material shirts are especially susceptible to this problem. Shirt collars must be able to maintain their shape shape, and so they are reinforced with more layers of fabric and often padded with additional and more rigid fabric sewn into the collar itself. New collared shirts often come with stiff collars that are crisp and rigid; however, after a number of washes and wears, the material that keep the collar stiff begin to soften, causing the shirt collar to lose its shape. This leads to shirt collars curling and folding. Shirt plackets are also partly responsible for keeping the shirt collar from sagging and folding since plackets are also reinforced to maintain their rigidity. However, shirt plackets also lose their structural integrity over time, no matter how good the fabric’s quality is. Collar Stays and the Slick Collar shirt collar support. You typically need both products to get your shirt collar to stand up and look crisp all day. Collar Stays are those little plastic or metal inserts that slide into the tiny pockets located on the inside front parts of your shirt collar. These little pickets are called Collar Stay Pouches. Collar stays inserted into the collar stay pouch, help keep the tips of your collar straight, preventing them from curling. Collar Stays come in various materials such as plastic, metal, bone, and other rigid materials. Some metal collar stays come with magnets and are called Magnetic Collar Stays. Polished stainless steel collar stays are durable and last a long time. The magnets that come with these magnetic collar stays are attached to the tips of the collar stays, from the inside of the shirt. Although these magnetic collar stays can hold some collar stays in place, they are also very easy to lose and often fall off with some body movement. They also do not provide the required support for the rest of the shirt collar, especially the back part which is most susceptible to folding under a suit jacket or sport coat. The Slick Collar Shirt Collar Support device makes your entire shirt collar stand up straight, while preventing the collar from getting tucked or fold under the weight of your jacket. The Slick Collar Shirt Collar Support device is adjustable in size that fit all men and women’s shirt collar types and sizes. The shirt collar and plackets are completely supported preventing the droopy, saggy, curled shirt collar. The Slick Collar keeps your shirt collar straight when unbuttoned or when under heavy garments such as jackets and coats, for a crisp professional perfect looking shirt collar that lasts all day. The Slick Collar is made from hypoallergenic food-grade material that is lightweight, durable and Flexible. These features allow it to provide a natural look that hides in the shirt collar while naturally moving and flexing with your head and neck movements. The Slick Collar Shirt Collar Support System comes in a Bundle Pack that contains two Slick Collar devices and two pairs of premium Collar Stays. The Slick Collars are adjustable to fit all collar sizes, and one of them is a slimmer version that is perfect for thinner profile collars, polo shirts, and women’s shirts.